Huge building plot on a nice western slope with a panoramic view of the famous thermal spa Heviz. Smooth slope. The land can be divided into two plots. All connections at the boundary. Old building shell from 1991 cheap for sale. Nice sunny situation on a southern slope. Approx. 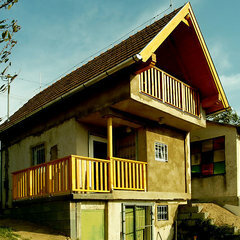 300m to the lake.The house (8x9m), cellar (half house, no dampness). Attic extendable to living space. Inside only load-bearing walls. Unique knights-castle-style building with 250m² living space and 300m² squash court with infrastruture. Best handicraft. Not finished for private reasons. Directly at the edge of the forest in the suburbs of Budapest.The two-storey living are can be sold separatly.Details and plans on request.